I offered some framing of the conversation, which I’m sharing below. Given the structural conditions all of us face, any conversation about the production, organization, preservation, circulation, and meaning-making of “stuff” inside and outside the academy must account for the conditions of increasing precarity faced by all of us. I was so grateful for Michelle Caswell, Stacie Williams, Eira Tansey, and Michelle Moravec for the discussion they enabled, and I hope the conversation continues. Good morning, and thank you for getting up at 8am on the last day of the conference to join a mix of archivists and historians in a discussion of the contested site of intellectual discovery. A location of the production of interpretation, meaning, and discourse both by those doing history and by those making order, history workers and information workers. The seed for this panel sits in what theorists might call affect and what I might call just being really annoyed: the frustration that archivists and other information workers feel when we read reports in the media that some document or other has been unearthed or discovered by a historian, revealed after being hidden or tucked away or some other trope that suggests that the archivists who process collections, write finding aids, and connect historians to those collections did not see those items first. 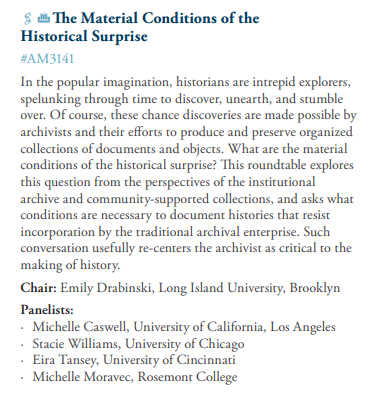 The trope of discovery suggests that historians were there first, when the material conditions for that meaning making required someone or someones else: those of us who work in the archives. Before we start this conversation, I’d like to offer one framing thought. As I prepared for this roundtable, I was struck by how strong our feelings, the feelings of information workers, are around this sense that we do not count, that we are forgotten, that our work is invisible, that the work of the academic historian is what gets purchase while we toil in underpaid contingent positions that rotate with the whims of organizations that fail to see archives and records and library collections as intellectual products that require expertise and the value of time-in-position. But we, of course, are not the only workers in the academy facing near total disinvestment in what we do and decimation at the hands of a corporatizing academy. For every David Blight or Nell Painter, there are literally tens of thousands of contingent academic historians. At CUNY, where I now work, adjunct faculty make up the vast majority of teaching positions. There are three times as many adjuncts as full timers. Those adjunct can make as little as $3200 a class, in New York City. I have been at CUNY for three weeks. Before I got there, I spent ten years at Long Island University, Brooklyn, a campus that fis not alone in having its history program literally shut down by an administration that claimed history was not longer relevant to the academic project. These neoliberal forces produce all of us as marginal and casualized. As we talk today I’d like us to keep in mind these material conditions, ones that have manufactured scarcity for all of us.